In addition to elevating the overall customer experience for visitors, one of the primary benefits of installing a parking guidance system (PGS) is an overall reduction in the time taken to park. Up to now, little has been done in the industry to objectively quantify the effects that a PGS has on driver decision-making and the parking experience itself. General assumptions have been derived from limited manual observation-based studies, customer feedback and onsite observations. 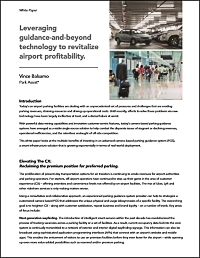 In collaboration with the Brisbane Airport Corporation, Park Assist recently completed a groundbreaking benchmarking study on the quantitative impacts of its M4 PGS on the time between vehicles entering the car park and parking in a vacant bay (referred to in this whitepaper as “Time to Park”). To our knowledge, based on the methodology used and sample size, it is the first of its kind in the industry. Conducted over a period of five months, our results emerge from the acquisition of nearly 1.2 million data points, translating to a total of 127,284 unique customer journeys. This white paper explores the findings of the study, which verify the ability of a PGS to make the parking experience far more streamlined, consistent and user-friendly. It also takes a look at the design and execution of the supporting science-based methodology used to ensure accuracy and integrity in the results. Click here or on the cover above to access a PDF version of the complete whitepaper. Luminaerospace, LLC demonstrated this new lighting fixture at Ohio’s Cleveland Hopkins Airport (CLE) for over a year, through all weather conditions. The system allows Pilots to intuitively recognize the actual pavement edges at night and/or in inclement weather. Additional enhancements have been made that allow advanced cockpit displays to detect infrared light for heads up displays and night vision goggles. The new lights improve pilot situational awareness even in good weather. Members of Luminaerospace, LLC are comprised of both aviation professionals and experienced passengers who recognized the need for improved boundary recognition. Luminaerospace, LLC was founded in 2010 as an intellectual property holding company for the patents related to elevated linear lighting segments. Patents have been granted in North America, Europe and Asia with additional protection pending in South America. The need for an improved boundary edge light has been recognized by pilots, airport personnel and passengers. The enhancement of this Pavement Edge Light Safety System has been embraced by many in the aviation community. For this safety improvement to be released, lighting manufacturers will proceed with design of their own versions to be certified by Intertek in accordance with the existing FAA specifications. It is the mission of Luminaerospace, LLC to license this technology to all existing airport lighting manufacturers and to encourage industry wide use of elevated linear lighting. Smart thermostats, camera-equipped doorbells, and talking virtual assistants have become commonplace in homes today. The goal of these technologies is to automate common tasks and make our lives easier. Similarly, airports are in an advent of technology, and are seeing exciting innovation with the Internet of Things (IoT). Air travel can often be filled with anxiety. The uncertainty of large crowds, long lines, confusion and delays when traversing the airport is not something most passengers look forward to. Imagine a smart, information-rich airport experience beginning at arrival and check-in, continuing through security, finding your gate, the lounge and retail experience, boarding your plane, inflight entertainment and connectivity, all the way through the hunt for your bag when you arrive at your destination. The IoT improves and interconnects technology, shifting the focus from people-to-people to thing-to-thing communication. In the end, though, the goal is to revolutionize the ways in which people access and consume useful information – and airports are at the forefront of this technology revolution. Airports are undoubtedly a “critical infrastructure” in the United States. It’s a delicate balancing act to maintain an airport’s security infrastructure, while remaining mindful of the impacts security measures can have on passenger satisfaction and the quest for rapid and seamless travel. An airport carries an intrinsic vulnerability, as it spans a very large area and contains multiple access points. Attempting to fortify the entire system is impractical for multiple reasons. A more adaptable and effective way to look at airport security is to consider multiple rings of defense. “The Five D’s”: Deter, Detect, Deny, Delay, and Defend – is part of established security practice – and has relevant application in the design of an effective, layered airport security approach. Each plays a specific role in securing your aviation’s instructure. The following provides an overview of the key principles of 5D. With global growth in passenger volumes set to continue, the competition amongst airports is likely to intensify. Airport operators must now demonstrate the value that they bring in the areas of operational efficiency and passenger experience. Both are central to airline decision-making when it comes to airport selection and airport relationships. Modern technology now offers airports a significant tool to enhance the value that they offer to airlines. It offers advantages in easing the passenger journey, and enhancing the travel experience. By incorporating IT into its value proposition an airport can strengthen its positioning and points of differentiation. Airports who do are in a better position to protect aeronautical revenues by justifying fees, as well as in delivering new and innovative services. This paper explores how airports can include IT into their value proposition to airlines and what this means both for airlines, as well as the passenger experience. By using digital signage for general information, wayfinding, alerts and advertising in key locations, airports can elevate their brand image and provide experiences that create real value. Not only will arriving and departing passengers nd their way around more easily; they will be more apt to spend extra time in the airport, and patronize vendors, when the environment is visually engaging and accommodating. As a total transportation display solutions provider, LG offers a wide range of durable and reliable commercial displays along with the software platforms for easy integration and remote management. 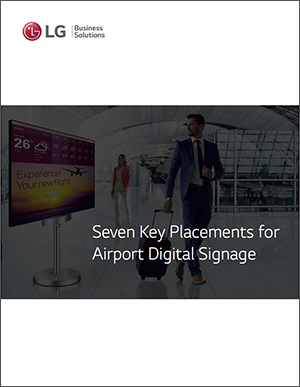 This eBook addresses seven key placements for airport digital signage, and the recommended display features to maximize ROI. Today’s on-airport parking facilities are dealing with an unprecedented set of pressures and challenges that are eroding parking revenues, straining resources and driving up operational costs. Until recently, efforts to solve these problems via new technologyhave been largely ineffective at best, and a dismal failure at worst. With powerful data mining capabilities and innovative customer-centric features, today’s camera-based parking guidance systemshave emerged as a viable single-source solution to help combat the disparate issues of stagnant or declining revenues, operational inefficiencies, and the relentless onslaught of off-site competition. 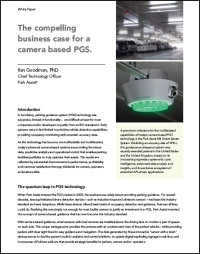 This white paper looks at the multiple benefits of investing in an advanced camera-based parking guidance system (PGS), a smart-infrastructure solution that is growing exponentially in terms of real-world deployment. Challenge: TSA regulatory requirements state that airport operators must show control of all the access points in their air operations area (AOA). For most airports, this means securing hundreds of remote access points and managing access for hundreds of key holders. Threats of insider theft by personnel add another layer of concern for airport operators. After 9/11, many airport systems were upgraded to increase security, but still for many, an update is crucial. An estimated shelf life of an access control system today is about 15 years old, with many airports utilizing systems over 25 years old. Solution: The CyberLock Flex System is the only access control solution that offers both hardwired and key-centric technologies within one software package. With the Flex system, an airport can keep their existing card reader hardware, while also securing hundreds of remote access points with CyberLock padlocks. The compelling business case for a camera based PGS. In its infancy, parking guidance system (PGS) technology was expensive, limited in functionality – and difficult at best for most companies and/or developers to justify from an ROI standpoint. early systems were in fact limited to primitive vehicle detection capabilities, providing occupancy monitoring with uncertain accuracy rates. As the technology has become more affordable and multifaceted, today’s advanced camera based systems are providing the robust data, predictive analytics and operational control that enables parking facilities/portfolios to truly optimize their assets. The results are reflected by substantial improvements in performance, profitability and customer satisfaction that pay dividends for owners, operators and parkers alike. Air freight volumes have continued their annual growth since the recession of 2009. The International Air Transport Association continues to forecast that economic growth and trade will accelerate, strengthening growth in air cargo volumes. Boeing reports that world air cargo traffic is forecast to continue this growth, at an average of 4.7 percent per year over the next 20 years, doubling the number of “revenue tonne-kilometers logged in 2013.” The number of airplanes in the worldwide freighter fleet will increase by more than double by 2035 as well. As this market continues to grow, it becomes increasingly important to ensure an efficient yet comprehensive screening of all of the goods sent to and from all over the globe. The latest threat detection and identification technologies help screen for constantly evolving chemical, biological, radiological, nuclear and explosive (CBRNE) threats to help the air cargo community safeguard society, protect life and support the free flow of trade. The events of September 11, 2001 prompted a significant increase in the Federal government’s involvement in airport security and operational matters. However, many aspects of these Federal aviation security programs and procedures have been debated by industry analysts and airport managers as to their effectiveness. One of these topics of debate is the issue of staffing at security checkpoints, particularly whether staff should be Federal employees or private security service employees. The debate is largely driven by customer service requirements as opposed to security requirements. However, both sides of this debate have their supporters. Overall in the industry, using Federal employees has been the trend at more airports to date. In spite of this, the alternative of using private employee services continues to remain a viable option and is supported through a series of official Federal programs and efforts. Over time, this alternative option of employing private service contractors for security screening has evolved into the current Screening Partnership Program (SPP) administered by the Transportation Security Administration (TSA). Under this program, if an airport would prefer to use private security employee services for passenger and baggage screening, it submits an application form to the TSA; after review and approval by the TSA, private screeners (subject to TSA supervision and jurisdiction) are typically in place at the airport within a year. Today, entry into the program is quick and simple. The process is hands­‐free, which is both an advantage and disadvantage to the airport. All airports surveyed by SBA report an excellent relationship with the private services and appear to be highly satisfied with the program. In particular, the program offers staffing flexibility that the TSA has difficulty with or, in some cases, cannot provide. Also, airports report increased customer service and customer satisfaction with the private staffing option. 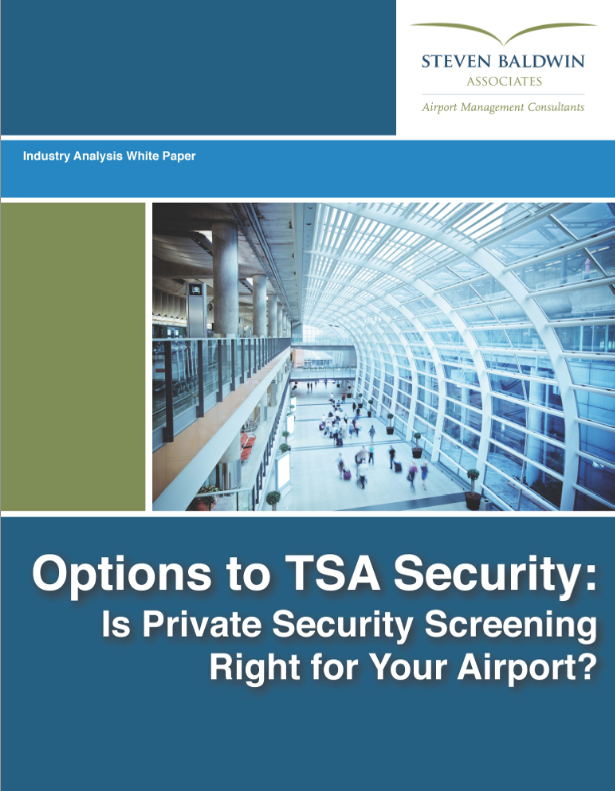 Taking the research and airport experiences into account, SPP vendors have proven to compete with the TSA screening service on all aspects of performance. In fact, measurable screening performance appears to favor the private screening alternative, but not by an overwhelming factor. Overall, airport sponsors that have specific needs or goals that can be met using the SPP—particularly around scheduling flexibility and customer service enhancements—should consider it as a viable option. Given that many airports could benefit from the increased flexibility in staffing and scheduling that the SPP provides, and given that many airports desire an improved customer service environment, we conclude the Screening Partnership Program could be successfully used by a wide variety of airports. In particular, a switch to the SPP may help alleviate issues such as long screening lines during peak passenger times as well as mitigate resulting issues such as dissatisfied passengers, airlines having to delay flights, and baggage left behind. The trend to save energy can be observed in many sectors. HVAC systems are certainly no exception. For more than 30 years now, Menerga GmbH located in Mülheim an der Rühr, Germany, has been concentrating on minimum energy applications. Based on its decades of know-how, the company sees itself as innovation leader in HVAC systems and offers sustainable efficiency. The objective is that new technologies and energy-saving solutions establish themselves as quickly as possible in the field. Effective systems to recover thermal energy have proven themselves, especially in climate control systems for indoor swimming pools, one of the key business areas for this company. As of result of this competence, this climate control specialist now has sales offices in 25 countries around the globe. Menerga sets itself apart as it typically supplies complete solutions. The reason for this is that only with completely harmonized and coordinated units can considerable amounts of energy be saved. These practical experts know that the capital investment costs for HVAC systems are only secondary. The operating costs are far more decisive, and here the energy usage represents the largest percentage. This is the reason that for over 10 years now, the company has been supplying Siemens IE2 motors as part of their drive solution. Ralph Berger, Head of Research and Development with Menerga explained: "Even back then, approximately ten percent of our customers selected energy-saving drive alternatives - with an increasing trend..."
Brooms first began to be used for airport snow removal in Canada in the mid-1950s. Convinced sweeping could be used in conjunction with plowing to make runways safer for the new high-speed jet airplanes, Transport Canada issued a request for development and testing of a runway sweeper. United Rotary Brush was one of the early - and only successful - broom manufacturer respondents to this RFP and has worked with Canada's Department of National Defense (DND) and sweeper manufacturers for the past several decades to refine the testing and qualification procedures. DND specifications continue to be the standard of reference for the industry today. Effective removal of snow, ice and slush from runways is essential to efficient airport operations. The presence of snow, ice and slush can cause serious safety concerns. Lack of traction can impede acceleration on takeoff, interfere with deceleration at landing, and interfere with directional control. In addition, frozen debris can cause severe damage to tires, engines and airframes. These conditions also raise business concerns. Flight delays or cancellations interfere with airline schedules, not only at the airport selected, but throughout the system. Such interruptions have dramatic impact on airline customer satisfaction and are increasingly the focus of passenger advocacy groups. In addition, cancelled flights represent lost revenue, both to the airlines and airports involved. Click here or on the cover above to access a 2mb PDF version of the complete whitepaper. Airport managers want projects done timely, economically and with high quality. As airport markets have matured, the redevelopment of facilities has become more complex and costly, with projects more likely to generate high impact on operations and the need to work around passengers, aircraft or ground vehicles. We started the Airport Owners - Guide to Project Delivery Systems to introduce aviation management and development professionals to techniques for procuring and conducting design and construction projects that other industries had found to be useful. It arose from a level of frustration by all of the stakeholders in airport development, the airport owners and operators, the design professionals and the construction companies, all of whom were tending to focus more time and attention in protecting their interests in the event of project failure and less time and attention positioning the project for success. The Guide is designed for use by the airport executive who must make the decision on the appropriate delivery method, and convince the governing authority that it is indeed appropriate; for the development professional who must make the recommendation to the executive and carry out the owner's role in the project 's delivery; and for the procurement practitioner who must undertake the proper contracting processes and documentation for selection of the contracting parties and administration of the project contracts in accordance with the laws, regulations and obligations of the owner, and, often, state and federal governments. The Guide contains sufficient detail for each of these role players to understand the characteristics and potential suitability of various project delivery systems and contracting approaches. 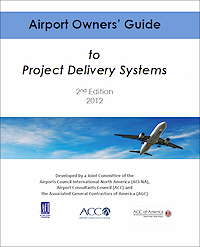 The airport executive may want to particularly focus attention on the sections describing considerations for selecting a project delivery method, specifically Section III A-D, Selecting the Appropriate Project Delivery System, Appendix C, Alternative PDS Selection: An Owner 's Example, and Appendix F, FAA Grant Program/Airport Improvement Program (AIP) which outlines the constraints and prospects for alternative delivery of FAA grant eligible projects. Among other things, the Guide identifies for the airport executive the kind of management support that is necessary under various project delivery approaches since the level of staff expertise and time demands on staff vary with the different methods. As well, the airport executive must consider any local political implications of different methods. The Guide is a reflection of industry trends and opportunities not a promoter of any particular project delivery approach or contracting method. It will always be a work in progress as those trends evolve and additional opportunities for delivering airport projects are explored. We hope it will be used as intended: to open airport owners and operators to the range of possibilities to deliver timely, high quality, cost-efficient facilities to their customers, employees and community. Click here or on the cover above to access a 12mb PDF version of the complete report. Gresham, Smith and Partners, a leading multi-disciplinary design and consulting firm for the built environment, is pleased to announce the Guidebook of Practices for Improving Environmental Performance at Small Airports has been published. 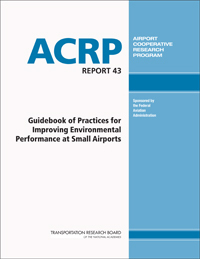 Developed by GS&P for the Airport Cooperative Research Program (ACRP), a research program managed by the Transportation Research Board (TRB) of the National Academies, the Guidebook provides managers of small airports with a resource that promotes environmental awareness, identifies federal environmental compliance requirements, outlines practices that proactively enhance environmental stewardship and identifies resources/tools that airports can use to be proactive. The Guidebook is available for free download from the TRB website and a hard copy version is available for purchase. 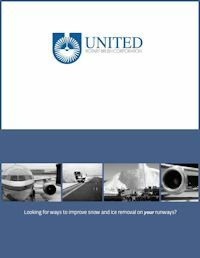 "We are glad this Guidebook is now available to the aviation community, providing a much needed resource that can raise environmental awareness and promote environmental stewardship," commented Robert W. McGormley, division vice president and senior environmental consultant for GS&P, who served as the project director and principal investigator. "Many small airports have limited environmental expertise and financial resources. 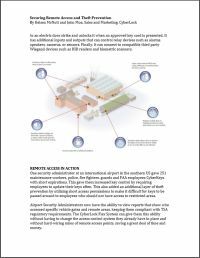 Through use of this Guidebook, airports of any size can better understand their environmental regulatory obligations and the considerations for and benefits of implementing proactive environmental stewardship practices, many of which do not require capital costs." Regulatory summaries presented in the Guidebook are grouped by similar subject matter and consist of high-level overviews of federal environmental compliance requirements including laws, regulations, and other directives. Web-based links to internet sites and documents are provided throughout the Guidebook to further describe the subject matter or provide supporting information. Case studies of environmental programs implemented by other airports offer readers greater insight into the real life experiences of implementing proactive environmental stewardship practices. The development of this Guidebook was led by GS&P with support from Vanasse Hangen Brustlin, Inc. and KB Environmental Sciences, Inc.
GS&P is currently working with the ACRP on three additional projects to benefit the aviation industry. First, GS&P is developing wayfinding and signage guidelines for airport terminal and landside use aimed at providing a methodology that can be implemented at airports nationwide and provide passengers with consistent, safe and efficient wayfinding systems. Second, GS&P is finalizing an ACRP handbook for the aviation industry entitled "Water Resource Issues Affecting Airport Capacity Enhancement Planning." This handbook aims to provide airport operators and planners with guidance in recognizing potential impacts that capacity enhancement activities may have on water resources while balancing business concerns and environmental protection and is anticipated to be available this Spring. Third, GS&P is in the midst of research to develop the "Guidebook for Selecting Methods to Monitor Airport and Aircraft Deicing Materials." This Guidebook will enable airports to identify, compare, and select practical on-site methods (i.e., instruments, technologies, techniques, etc.) for monitoring deicing materials in airport storm water runoff. Being able to make informed decisions on monitoring technologies will be extremely important to airports subject to pending federal environmental regulations affecting airport deicing operations. Click here or on the cover image above to access a PDF version of the complete guidebook. Ricondo & Associates, Inc. (R&A) prepared the Industry White Paper titled "Credit Rating and Cash Reserves: How They Influence the Borrowing Costs of Airports" recently released by Airports Council International - North America (ACI-NA). The paper discusses the influence of credit ratings and cash reserves on the borrowing costs of airports. The request for the White Paper stemmed from an airport - airline roundtable discussion at ACI-NA's 2009 Economic and Finance Conference regarding ways in which the two industries could work together to control airport costs. As part of the discussion a representative of Alaska Airlines introduced six "red flags" that, in the carrier's opinion, indicate an airport's interests may not be aligned with those of the airline. One of the elements the Alaska Airline representative cited was the difference between airport and airline credit ratings, which spurred a debate with audience members regarding the importance of high credit ratings to airports in order to reduce borrowing costs and maintain access to the municipal bond market. Central to this debate is the different viewpoints of airports and airlines regarding the level of cash reserves and debt service coverage required to maintain an airport's credit rating, and whether achieving such high ratings places costs on the airlines that outweigh the benefits. findings rather than drawing conclusions and recommending any particular actions. 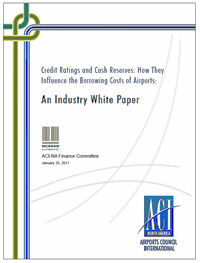 This paper was prepared at the request of the ACI-NA Finance Committee, which provided oversight of the project, to promote discussion within in the industry, and with their airline partners, regarding how cash reserves support the sound credit ratings of Airports and thus help reduce borrowing costs for critical infrastructure projects. 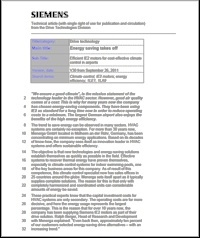 Click here or on the cover image above to access a PDF version of the complete report. The new age of mass-market Plug-in Electric Vehicles (PEVs, or EVs) is here as the first shipments of the Chevrolet Volt and Nissan Leaf have arrived while the Tesla Roadster, a high-performance all-electric vehicle, has been selling for over a year. According to the US Department of Energy, up to 45,000 PEVs could be available for US drivers by 2011 and that's just the beginning. In his 2011 State of the Union address, President Barack Obama called for putting one million EVs on US roads by 2015 to build on America's technical leadership, create new jobs and reduce transportation dependence on foreign oil. Pike Research anticipates the U.S. will be the largest market for EVs in 2015, followed by China and Europe. 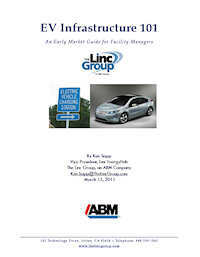 This paper was prepared by Ken Sapp, Vice President, Linc EnergyHub, The Linc Group, an ABM Company.